The very first storical records referring to the town go back to the beginning of the 13th century. It was during the Middle Ages that the town experienced its greatest moment of splendour. However, this was a period in which had to defend itself against constant assaults by the cities of Norcia and Spoleto. Present-day Cerreto di Spoleto is known above all for the harvest of the black truffle. Artistically, Cerreto is able to offer an impressive experience, due to its public and religious buildings dating back to the period between the Middle Ages and the Renaissance. Cerreto's most famous monument is without doubt the church of St. Giacomo (14th-15th centuries). The inside walls are covered by a series of paintings on two levels which, for the most part, date back to the 15th century. In particular, the stories of the lives of St. John and St. Catherine, the splendid pictures of the Madonna with Child and of the Crucifixion, are noteworthy. 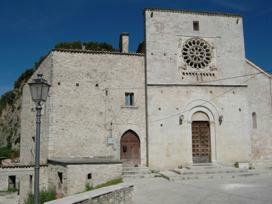 The church of St. Mary De Libera, also dating back to the Renaissance period, contains precious frescoes of the Umbrian and Marche schools in its lateral chapels. Borgo Cerreto is an attractive village in the immediate vicinity of Cerreto di Spoleto. It was traditionally under the dominion of the most powerful village of Cerreto, and was rendered a real defensive fort, as one can still see from the ruins of the walls and the towers. Finally, in the vicinity, near the village of Ruscio, you should not miss the Sanctuary of the Madonna of the Star, which used to be a 17th century Augustine Hermitage.